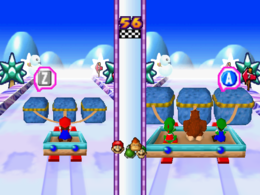 Thwomp Pull is a 1-vs-3 player minigame found in Mario Party 3. One player has to press the correct buttons to move the three Thwomps while the other three players are assigned a button to press and do the same thing together. Snowmen will throw balls at the lane. If a player gets hit by one, he/she will be stunned. The first player or team to reach the finish line wins. However, if they don't make it within sixty seconds, the game will end in a draw. Game Rules – "Press the buttons the Thwomps tell you to with good timing to move your sled forward." Advice – "If you press the wrong button, the Thwomps will get confused and pause. Be careful not to make mistakes." This page was last edited on September 5, 2018, at 11:41.